Canadian consumers are being asked to weigh in on proposed new front-of-pack warnings for foods high in saturated fats, sugars and sodium, starting this weekend. And while whole milk would get a pass from such a plan, Canada’s dairy farmer organization fears many other dairy products would wind up wearing such warnings, thus “alarming” consumers. Federal Health Minister Ginette Petitpas Taylor on Friday announced Health Canada will run public consultations from Saturday through to April 26 on rules requiring a new nutrition symbol on foods. The consultation documents available online include four different options for a front-of-pack symbol. 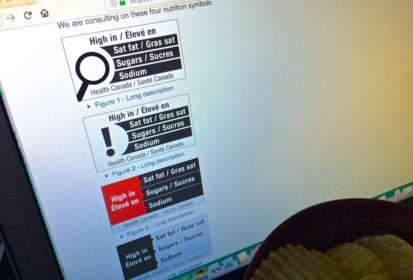 Health Canada, in its release, cited research showing Canadians consume “too much” of these nutrients, with eight of 10 Canadians consuming too much sodium and “almost one in two” Canadians eating too much saturated fat. Dairy Farmers of Canada, in a separate release Friday, said it would take part in the consultations, noting Health Canada “recognizes the scientific evidence demonstrating the nutritional value of milk as a key contributor to the health of Canadians” by exempting whole milk from the label proposal. “However, as currently proposed, many other dairy products, rich in essential nutrients, will be stigmatized by a warning label that may confuse consumers as to which products are healthy and which are not,” DFC said. DFC, in its release, didn’t specify which dairy foods might be affected by the proposed label rule. increasing levels of vitamin D in milk and margarine.